Experts had been warning the residents of Kathmandu of a devastating earthquake since decades. Nepal sits astride the convergence of the Indian and Asian tectonic plates and seismic activity is common in the region. A tremor the size of the weekend occurs about every eight decades. In 1934 — 81 years ago — more than 10,000 people died following a magnitude 8.1 earthquake in eastern Nepal, about six miles south of Mount Everest. A smaller quake in 1988 with a magnitude of 6.8 killed more than 1,000 people. The United States Geological Survey wrote in its summary of the earthquake: “The quake occurred as the result of thrust faulting on or near the main frontal thrust between the subducting India plate and the overriding Eurasia plate to the north. At the location of this earthquake, approximately 80km to the northeast of the Nepalese capital of Kathmandu, the India plate is converging with Eurasia at a rate of 45 mm/yr towards the north-northeast, driving the uplift of the Himalayan mountain range. The preliminary location, size and focal mechanism of the April 25 earthquake are consistent with its occurrence on the main subduction thrust interface between the India and Eurasia plates." Seismicity in the Himalaya dominantly results from the continental collision of the India and Eurasia plates. Northward underthrusting of India beneath Eurasia generates numerous earthquakes and consequently makes this area one of the most seismically hazardous regions on Earth, writes the USGS. However, this highly populated region including Nepal and most of the northern and north-eastern Indian states are very poorly prepared for dealing with a jolt. A study by GeoHazard International, a non-profit organisation that aims to aid disaster torn countries, found that two-thirds of the structures built in the region do not meet seismic code standards. The study found that “rapid urbanisation, with its resulting unplanned growth and inadequate enforcement of regulations, has led to substandard and unsafe housing patterns”. Brian Tucker, president and founder of GeoHazard, said that in the 1990s, his organisation predicted that if the 1934 quake were to happen again, 40,000 people would die because of migration to the cities where tall, flimsily built buildings would collapse. In an update just this month, GeoHazards wrote, "With an annual population growth rate of 6.5 per cent and one of the highest urban densities in the world, the 1.5 million people living in the Kathmandu Valley were clearly facing a serious and growing earthquake risk." Kathmandu and the surrounding valley sit on an ancient dried-up lake bed, which contributed to the devastation. “Very, very soft soil, and the soft soil amplifies seismic motion,” said Dr. Tucker during his interview with the New York Times. “Tehran; Haiti; Lima, Peru; and Padang, Indonesia, were similarly vulnerable. In those places, nearby tectonic faults are under strain, and building standards and disaster preparations are seen as inadequate,” added Dr. Tucker. Dr. Lung S. Chan, who is a geophysicist at the University of Hong Kong, told the Wall Street Journal, “The collision between India and Eurasia is a showcase for geology. The India plate is pushing its way north toward Asia at a rate of about 5cm a year. Geologically speaking, that’s very fast.” This is the force that has pushed up the highest mountains in the world, in the Himalayas, and has set off devastating earthquakes. “As the plates push against each other, friction generates stress and energy that builds until the crust ruptures,” Dr. Chan added. Saturday’s quake was relatively shallow, according to the U.S. Geological Survey. Such quakes tend to cause more damage and more aftershocks than those that occur deeper below the earth’s surface. Roger Bilham, a professor of geological sciences at the University of Colorado, who has studied the history of earthquakes in that region, told the New York Times that the shaking lasted one to two minutes, and the fault slipped about 10 feet along the rupture zone, which stretched 75 miles, passing under Kathmandu. 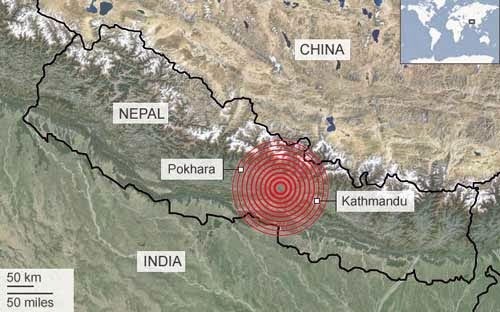 Aftershocks as large as magnitude 6.6 have occurred mostly to the northeast of Kathmandu. It is possible that the Saturday quake was a preface to an even larger one, but Dr. Bilham said that was unlikely. Experts had been warning the residents of Kathmandu of a devastating earthquake since decades. Nepal sits astride the convergence of the Indian and Asian tectonic plates and seismic activity is common in the region.